Illustrations: 51 b/w photos and 5 line illustrations. Walt Whitman: The Song of Himself is the first full-length critical biography of Walt Whitman in more than forty years. Jerome Loving makes use of recently unearthed archival evidence and newspaper writings to present the most accurate, complete, and complex portrait of the poet to date. This authoritative biography affords fresh, often revelatory insights into many aspects of the poet's life, including his attitudes toward the emerging urban life of America, his relationships with his family members, his developing notions of male-male love, his attitudes toward the vexed issue of race, and his insistence on the union of American states. 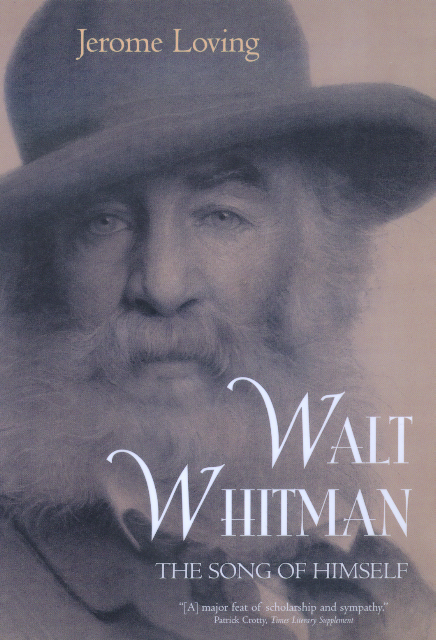 Virtually every chapter presents material that was previously unknown or unavailable, and Whitman emerges as never before, in all his complexity as a corporal, cerebral, and spiritual being. Loving gives us a new Poet of Democracy, one for the twenty-first century. Loving brings to life the elusive early Whitman, detailing his unhappy teaching career, typesetting jobs, quarrels with editors, and relationships with family and friends. He takes us through the Civil War—with Whitman's moving descriptions of the wounded and dying he nursed, the battlegrounds and camps he visited—demonstrating why the war became one of the defining events of Whitman's life and poetry. Loving's account of Whitman's relationship with Ralph Waldo Emerson is one of the most complete and fascinating available. He also draws insights from new material about Whitman's life as a civil servant, his Lincoln lectures, and his abiding campaign to gain acceptance for what was regarded by many as a "dirty book." He examines each edition of Leaves of Grass in connection with the life and times that produced it, demonstrating how Whitman's poetry serves as a priceless historical document—marking such events as Grant's death, the completion of the Washington monument, Custer's defeat, and the Johnstown flood—at the same time that it reshapes the canon of American literature. The most important gap in the Whitman record is his journalism, which has never been completely collected and edited. Previous biographers have depended on a very incomplete and inaccurate collection. Loving has found long-forgotten runs of the newspapers Whitman worked on and has gathered the largest collection of his journalism to date. He uses these pieces to significantly enhance our understanding of where Whitman stood in the political and ideological spectra of his era. Loving tracks down the sources of anecdotes about Whitman, how they got passed from one biographer to another, were embellished and re-contextualized. The result is a biography in which nothing is claimed without a basis in the factual record. Walt Whitman: The Song of Himself will be an invaluable tool for generations to come, an essential resource in understanding Leaves of Grass and its poet—who defied literary decorum, withstood condemnation, and stubbornly pursued his own way. Jerome Loving is the author of Lost in the Customhouse: Authorship in the American Renaissance (1993), Emily Dickinson: The Poet on the Second Story (1986), Emerson, Whitman, and the American Muse (1982), and Walt Whitman's Champion: William Douglas O'Connor (1978). He is the editor of Frank Norris's McTeague (1995), Walt Whitman's Leaves of Grass (1990), and Civil War Letters of George Washington Whitman (1975).